Beverly Hills, Pasadena, South Bay, San Diego, Inland Empire and all of Southern California OC Caterers. With 20+ years of experience, we’ve earned our reputation as one of the best in the business. Anders Catering constantly strives to exceed our client’s expectations by designing and planning celebrations that will be remembered forever. We are actively growing new business, developing staff members and helping nonprofit organizations with affordable high quality catering. At Anders Catering, we promise the most and always deliver a celebration that’s truly unique and personal. We offer total special event design, custom menus, cooking fresh on location, special event venues and community event design (visual arts and nation name musicians relations, corporate sponsorships, and event advertising). Anders Catering was created to answer the growing need for unique, innovative and creative event solutions. Throughout the past nineteen years, Anders Catering has elegantly produced the finest wedding receptions, parties and special events possible. Starting with a clear understanding of the clients needs, Anders Cateringcreates a custom tailored event with menus of imaginative cuisine and harmonious event coordinating. Anders Catering always provides the best in quality foods and friendly service. From the stage of Irvine Meadows, full service dinners served to the supporters of the Pacific Symphony Orchestra Summer Concerts to grand post receptions for international stars Robert Goulet, Al Jarreau, Johnny Mathis, Dave Brubeck, Herbie Hancock, Poncho Sanchez and Arturo Sandoval held at the Orange County Performing Arts Center. Over the years, Anders Catering has been helping community minded groups stay in budget with special pricing for their events. In 1993, Anders created the Orange County Art & Jazz Festival and for seven years offered affordable high quality community events, educational and social outreach programs. Many other special community events were created with The Orange County Fair, Imagination Celebration of Orange County and Bowers Museum of Cultural Art. In 1997 and 1998, Anders was nominated for the Orange County Business Committee Arts Award by Ruth Ko of Orange Coast Magazine & TV personality Hugh Hewitt. 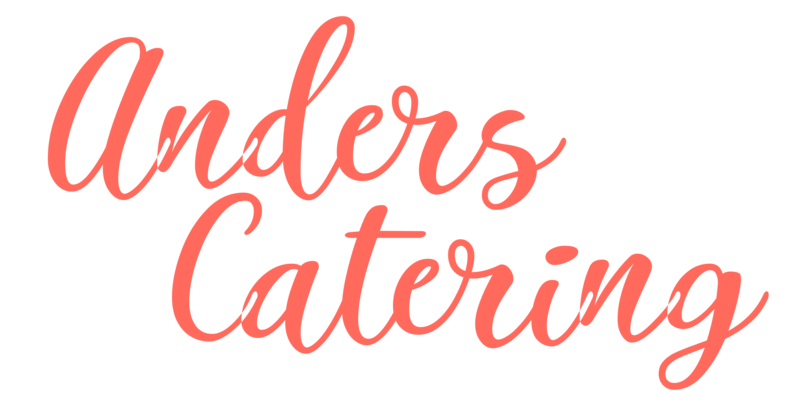 Anders Catering understands the importance of great customer service combined with exquisitely prepared meals with the freshest ingredients. We hope to serve you and help make your special celebration an extravaganza to be remembered. Anders Catering will put the special in your event. Wedding Receptions are very special to Anders Catering. It’s one of the most important events in ones life and is remembered forever. Anders Catering considers it an honor to be apart of the special celebration that brings together two sole mates. Success is in the details of planning the reception. Your wedding reception buffet will be exquisitely decorated with fresh flower accents, palm leaves and flowering kale. Anders Catering buffets includes buffet tables, white buffet table linens, white skirting, silver platters, marble, glass bricks chaffing dishes and high quality disposables. Anders Catering offers customized Wedding menus and can include an onsite Event Coordinator. Our exclusive staff can provide the most elegant of wedding feasts for your special day. We can also provide customized menus for ethnic themed events or customize any dish to your liking. Our team is experienced and can help facilitate any arrangements for your other Wedding needs, such as, Invitations, Decorations, Flowers, Rentals and Entertainment. In keeping with our goals to help make your Wedding unforgettable, Anders Catering can help you plan your Wedding in every aspect, from start to finish. We would be happy to discuss all of your Wedding needs. We are the Orange County Catering Weddings specialists! We would be delighted to customize a package tailored to your exact needs and within your budget.